Never say ‘Never’ – Is JLR right to steer clear of the driverless car? Jaguar Land Rover’s director of Research and Technology, Dr Wolfgang Epple, said recently that JLR will never make a driverless car. But is this a realistic stance for one the UK’s leading automotive manufacturers? There’s little doubt at this stage that the driverless car is just around the corner. In fact, in many respects, the driverless car is already here – you just can’t wander into your local dealership and buy one yet. Huge progress has been made with autonomous vehicles in recent years, with Google in particular making big strides in the US. In May, the tech giant revealed figures on collisions that have occurred during the initial stages of its driverless programme, claiming that the handful of minor incidents have been the result of third parties and/or driver error. According to Google, its autonomous vehicles have not been responsible for a single fender bender. “I guess our biggest learning from the accidents has been that people don’t pay attention, even trained drivers,” said Google co-founder Sergey Brin at the company’s recent shareholder meeting. What future then, for human beings behind the wheel? Brin – who heads up Google’s driverless project – seems to imply that people simply can’t be trusted to drive to the same level that computers can, and the figures so far seem to support him. Computers don’t get tired, or angry, or distracted by the latest billboard advertising on the drive home from work. But fully autonomous vehicles are a long way off yet. Google’s cars can navigate the California highways with ease, but they aren’t being let loose on the winding streets of San Francisco during rush hour just yet. The ability to navigate complex and constantly evolving traffic situations remains solely with us – for now at least. If Dr Wolfgang Epple has anything to do with it, it will remain that way as well. Jaguar Land Rover’s director of Research and Technology says he is not interested in driverless cars, and wants the driver to be at the centre of technological change. Speaking this week at JLR’s technology showcase in Gaydon, Epple outlined his vision for autonomous vehicles, and the role of human agency in the future of driving. Driver safety and comfort are central to JLR’s plans for autonomous vehicles. For Epple, car autonomy is something that should be there to assist drivers, not replace them. According to him, JLR has no intention of developing a driverless car, and that the notion is not one which appeals to the many employees at JLR for whom driving is not simply a way to get from A to B. “Rest assured, within Jaguar Land Rover there are so many automotive enthusiasts, we will make sure there is never a driverless car from JLR,” Epple boldly proclaimed. It’s a sentiment that many drivers around the country will undoubtedly relate to. Cars are more then simply a method of transport for some people, and driving can provide a huge amount of joy when roadworks and traffic aren’t around to spoil the fun. Lots of people find driving relaxing, and the idea of handing over the controls to a computer and essentially being taxied around is not something everyone finds appealing. 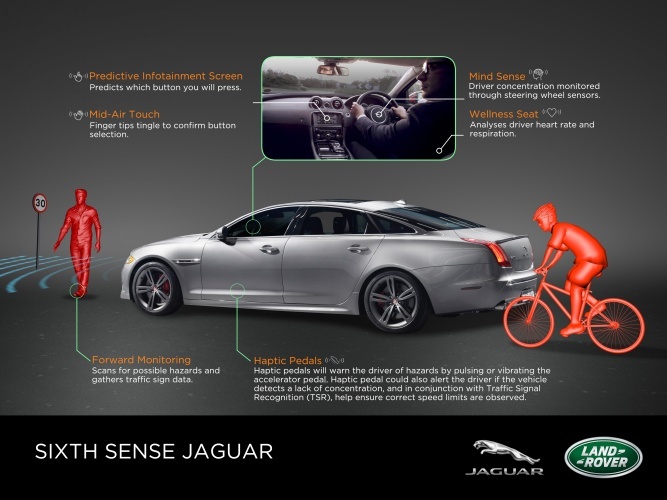 JLR is looking into monitoring driver brainwaves through the steering wheel. That’s not to say technology doesn’t have a role to play, just that it should develop to assist drivers rather than push them aside. The programmes that JLR is focusing on are intended to do just that. 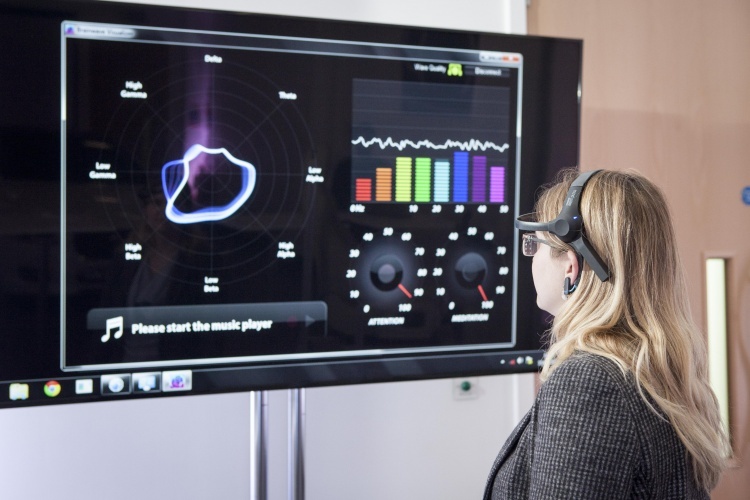 Mind Sense is an ambitious project investigating if brainwaves can be used to gauge driver alertness, monitoring brain activity through the steering wheel and delivering prompts when concentration slips. 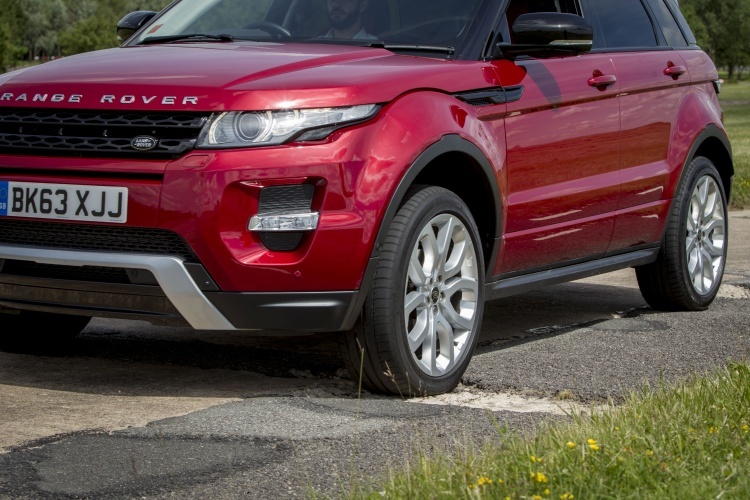 Elsewhere, The Engineer recently covered JLR’s progress with Pothole Alert, a system designed to map hazards in the road surface, with information potentially shared with other vehicles and local road authorities. Information on potholes could be collected and shared with other drivers and with road authorities. Other technologies on display in Gaydon included the Predictive Infotainment Screen, a system that uses cameras and path-tracking filters on the central control panel to predict where fingers are aiming. JLR claims this increases the speed of successful button selection by 22 per cent, reducing the amount of time drivers have their eyes off the road. 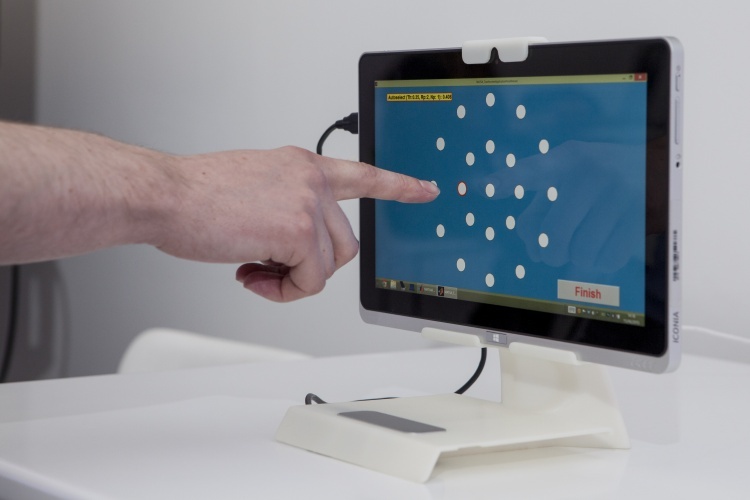 The system is being trialled in conjunction with Mid-Air Touch, which provides haptic feedback to the fingertips using ultrasonic sensors. Confirmation of a button selection can be delivered in mid-air, without the driver having to touch the screen. JLR is trialling a system that uses cameras and path-tracking filters on the central control panel to predict where fingers are aiming. The common aim across all these projects is to make life easier for drivers, improving vehicle safety and comfort rather than working towards driverless cars. As technology continues to evolve however – and companies like Google continue to push the boundaries of vehicle autonomy – it will be interesting to see if JLR can remain true to the values of Dr Epple. In years to come, it seems certain there will be a market for fully autonomous cars, capable of operating in all environments. But for now at least, JLR’s focus remains firmly on the driver. Humans still appear have a future behind the wheel. For how long, we shall have to wait and see. Humans either drive because they have to or because they just enjoy doing it. Those who have to are welcome to step into the driverless car. You don’t buy a Jag because you have to, you do it because you want to experience performance and handling at it’s best. There is space for both markets. I agree with Wolfgang – fully autonomous vehicles will never suit the enthusiast and for them (me) the technology which enhances safety should remain as an aid only. However, there’s no doubt that for a good proportion of road journeys, autonomous vehicles are the future. Think taxis, buses, some delivery vehicles and for people who really would prefer not to drive. The impact these vehicles could have on road space reduction, safety and fuel consumption is enormous. To be honest I want both, there are times it would be great to just switch off (me) and let the car take the strain other times switch off (the car) and I drive! As I an fairly average, I suspect others will want the same. With the age group of 35+ the age bracket that can afford JLR products, they have out grown being girl and boy racers (generally! 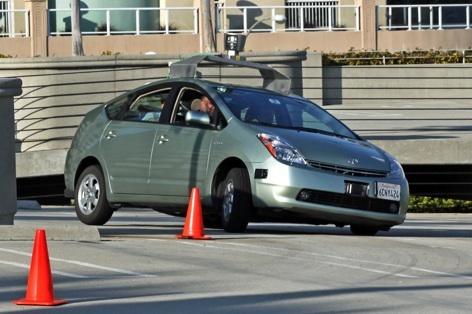 ), driverless cars will be also be in high demand in demand as the population grows older. Thank goodness someone is working to keep the passion is driving. Driverless cars will be utterly utilitarian, as cared for as a commuter railway carriage or a rubbish skip. Sure, they will do a useful job, but can you REALLY imagine anyone hankering for a go in a transport podule? Right, I’m off now for a ride on my brand new Kawasaki Versys. Just for the fun of it. While I still can! I completely agree with JLR on this one. There isn’t much point to owning a distinctive and exciting car if you don’t enjoy driving and just use it to get from A-B. Reminds me of the “Jaguar will never make a diesel” statements of the 1990’s. Others have commented on the difference between “driving for fun”, and getting from A to B.
Jaguar clearly are focused on those who want cars for fun, and therefore have no interest in driverless cars. However, many people can only afford (or justify) one car. We sometimes have to make the tradeoff between the useful people carrier or the fun cabrio. Clearly, a car which can be fun to drive, but which can also do the school run without you, is more useful than just the former. When the choice is a Jaguar or a BMW which can also do the school run, Jaguar will lose sales. So, they may not produce a car without a drivers seat, but they will produce a car which can self-drive. Either that, or they won’t produce any cars. This seems to imply equivalence between a computer and its sensor array and human beings with their attendant senses – this isn’t the case. As an example, I was riding my motorcycle along a country ‘B’ road when I noticed some birds fly up from the hedge next to the road; as I got nearer I could see a slight movement in the foliage so began to brake and was glad that I did because a fallow deer decided to leap out in front of me – I was able to avoid a collision because of my anticipation of a possible hazard. There is no way an autonomous system would pick up on subtle cues like this. Is Alex suggesting that unaccompanied children should be allowed to use driver-less cars? ‘Autonomous’ doesn’t mean infallible – an autonomous car could still have a puncture, brake failure, or develop an engine fault and grind to a halt. Unfortunately most people in the world can’t afford a fun car and in most parts of the world there is no longer fun in driving. Soon the JLRs will be restricted to off road events because the autonomouses wont trust them sharing the road. Look who is planning to become the big car makers of the future. Battery manufacturers and software writers. There is no hope for enthusiasts and fun vehicles. If JLRs are allowed out there will be compulsory self reporting of speed violations and most driving “errors”. So all the humans will lose their licences anyway. Jumbo Jets carrying millions of passengers every year in ever more congested skies still require pilots; yet flying is a past-time for some. Horse and Carriage was the transport of choice for Man for hundreds of years (and could still get you home when incapacitated!). The only true driver-less vehicles are restricted to controlled environments of tracks. Until the environment changes – i.e. no pot-holes and straight, well marked lines with trees that don’t grow – without unpredictable humans everywhere; then driver-aids will rule. Battery Manufacturers and Software Writers are struggling to predict an ever changing landscape on the fly without true AI. AI itself will be required to make choices where the human brain bypasses the analytical and relies heavily on survival and baser instincts. And true AI, as we know, may not be interested in taking you to work every day! Talking to Epple’s boss, Ralf Speth, recently, he didn’t dismiss autonomous vehicles outright. Indeed, he thought they might be a good idea for his aged dad. But Speth’s main interest seemed to be in getting lorries (trucks) carrying cars from JLR’s factories to Southampton docks on their way to buyers overseas. As most of the journey is on motorways, the technical challenges for autonomous driving are reduced. Indeed, according to Speth a lot of the technology is already there. My guess is that JLR will completely reverse their position within a decade. To follow Wolfgangs dictat would be suicide for any car company, when every other manufacturer offers driverless cars will JLR really be the only one not to? Utter nonsense, of course they will have to. My concern is that their is such blinkered views at the top of JLR possibly spells troubles for a company that refuses to innovate. Does ABS detract from driving? Is cruise control a step to far? this reminds me of all the silly moral panic there was in the run up to the first human heart transplant. It is just a shame that JLR has such a luddite in so senior a position. I’d have thought, human nature being what it is, you could safely say “. . is something that no-one finds appealing.” More than likely, the first autonomous cars will become associated with those who’d benefit most – the elderly and handicapped who aren’t well served by public transport. If that image sticks, nearly everyone who can drive would choose to drive themselves. Computer controlled vehicles are a logical choice for an urban taxi-bus, but I think there would be some opposition to that from taxi drivers. If I were a passenger in the car pictured above, I’d be very uncomfortable and probably swearing at the idiot driver. I have never tested any car to that degree of lateral g. I’ve only ever driven on public roads – don’t get invited to Top Gear. Now imagine a car leaning over the opposite way. . Not only would the passengers be much more comfortable, the driver (or computer) would actually be in good control of the chassis dynamics and the tyres would have a better grip on the road. Of course, JLR, Toyota, VW Audi, Honda, Ford, BMW, F1 and the rest of the automotive industry will all kid themselves that their designs already make cars that are as fast and as safe as the laws of physics allow, but that’s nothing more than hubris. They are all wrong – that’s easily proven. It’s hard to believe now, but very similar strongly held arguments were used against the introduction of seat belts; including personal freedom, being a better driver when unrestrained, and every naysayer knew somebody who’d been “thrown clear” during an accident. In a couple of decades (perhaps less) we’ll look back with disbelief that anyone could drive in “manual mode” on public highways. Yes it’s unfortunate the excellent drivers amongst us won’t be able to get their thrills without visiting a track but the reduced death toll, lower traffic congestion, cleaner environment and preserved resources might just be worth it. It is frustrating that advances in machine learning mean that computers will become safer drivers than us but denying it won’t stop it. Not only will the car and its sensors be able to identity and react to the anomaly of a deer startling birds out of bushes it will be able to share its knowledge with other autonomous vehicles. Don’t worry about it, IF all vehicles are so fitted within what is a standard price, then like anything else you can always turn it OFF! As for Alex’s idea of a driverless vehicle taking the kids to school, I suggest that it will be along time before any of these vehicles will cope with the chaos outside any scholl and delivery and collection time. What happens and who is going to decide which “idiot” has to back off? Driver-less cars will do a far better job of both driving and parking than the mindless dads and yummy-mummies, who use JLR’s vehicles in the streets around the public schools here in Cheltenham! Once I wanted to buy a Land Rover. The Range Rover out of my pay grade, I had a sit in with a Defender. Defenders being available second hand. I couldn’t get in behind the wheels. I’m not fat, just tall, and I couldn’t get my legs into the car under the steering wheel. I have ample space in a Mazda 323, though, I even rented a Suzuki Jimny twice in Bali. What’s the point of a nice name? My school was in walking distance from home. No need for car or bus. We used the bicycle to get to the sports club three times a week. For any given problem there are always a number of unexpected solutions. Moving away slightly from the Driverless / Driven argument and looking at the technology JLR want to offer. Essentially this all goes back to ergonomics. If we draw an analogy with aircraft we se the following. Haptic Feedback Pedals – In (military and civil) aircraft stick force (control stick) is varied with speed so that control input is reduced proportional to speed, you don’t necessarily want to be putting full input in at high speed, and stick force is a simple way of restricting this. Also as most aircraft reach stall speed a simple shaker on the stick (yoke) warns the pilot through ‘haptic’ feedback of the impending flight upset. Mid Air Touch – Lets shape the buttons differently typically most modern cars have a series of flat (non-differential) buttons that require you to look at what your feeling to confirm the correct button / switch. Again aircraft employ different shaped switch knobs so that feel alone helps confirm you have the correct switch, at least on critical switches. A better look at ‘true’ ergonomics would help car users operate their machines more efficiently and with eyes on road. It always makes me chuckle when I see or hear terms like ergonomic display in car adverts. As really you only have a multimode display which often requires eyes-off-road to get to the mode / function you require. Come on car manufacturers, less modes, better laid out, with differentiated controls will allow us more eyes-on-road time and less ‘Head down’ trying to work out how to tune the radio, see fuel consumption etc. That would be a continuous hum , then , in the fourth world that is Tameside, Greater Manchester. There is an opportunity for cyclists to be employed as Flag Bearers in front of these vehicles and be paid £1.00 per km. The population as a whole proves on a daily basis that they are incapable of driving. The number of people killed and injured on the roads is horrendous and wouldn’t be tolerated if it were any other activity. A mindset has evolved where driving is seen as an inalienable right which is proven by how easy it is to get and keep a driver’s licence. Well, you’re not alone. 93% of drivers consider themselves above average / very good / excellent according to a recent study. A single misjudgement is all it takes to end someone’s life. You might think it will never be you’re sadly deluding yourself.